Author breakingbrca1Posted on April 3, 2019 April 4, 2019 Leave a comment on Give Me That Patch! Author breakingbrca1Posted on September 27, 2018 October 9, 2018 Leave a comment on Post Chemo Hair Problems! Symbolism, an artistic and poetic movement or style using symbolic images and indirect suggestion to express mystical ideas, emotions, and states of mind. When I was in remission (shortly after my double mastectomy), I really wanted to show off my pride of being a breast cancer survivor. Not only am I now a breast cancer survivor, but a BRCA+ warrior. I had my heart set on a Sydney Evan Awareness Ribbon necklace. It was perfect. Not overstated. Not understated. A delicate, sweet symbolic representation of my breast cancer plight and new remission status. And in real honesty, it was also a way for me to feel more comfortable about going out in public with my short hair. I was always self conscious about how I looked in public wearing a head scarf during chemo, but when my hair started to grow, I was actually even more self conscious. At least when I had a head scarf, it was obvious I was in treatment. With very short hair, I wasn’t really sure what others would make of my appearance. Donning a pink ribbon necklace, was a way for me to feel a tinge more comfortable as my hair growth journey began. It provided an unspoken message and understanding to strangers that yes, I am a breast cancer survivor. My sister and I discussed getting symbolic tattoos that represented our BRCA/cancer journey’s. As I mentioned in earlier posts, she decided to get a preventative mastectomy after I was diagnosed. She tested positive for BRCA1 mutation at 19. After some thought, however, I decided not to pursue the tattoo, and for the first time in a year and a half, I took off my Awareness Ribbon necklace to put on something else. Not that I am no longer proud of my cancer fight, or even letting go of that identity as a cancer survivor/BRCA+ woman, I just don’t need it to define the person I am today. I can embrace the journey, the experience, the memories (good & bad), the courage, awareness, and the understanding of how precious life and our health is, within my own personal evolution. I no longer feel the need to express it on a daily basis, even as a small representation in the form of a delicate necklace hanging on my chest. Sure, I will definitely wear it again, but today, as I look at the person I have become, the pain and challenges I’ve faced, I can thankfully take it off with ease and allow myself to just be Alyssa; mother, wife, daughter, sister, friend, corporate executive, dog owner, music lover, singer, cancer survivor, BRCA1+. We are all in different stages of our BRCA journeys. I hope in sharing some of my thoughts, others can take comfort that even though their BRCA journey may have just begun, or perhaps somewhere stuck in the middle, there’s much more life to live afterwards. It will always be a part of your life, but in eventuality, just a piece of your whole story. I’ve been thinking a lot lately about what defines the female body and what makes a woman feel like a woman. I thought the hardest part of my BRCA journey would be losing both breasts, which I still struggle with to this day, but as my 39th birthday approaches, I’ve been thinking more and more about losing my ovaries at 40. I didn’t think approaching this stage would create so much fear and anxiety, but unfortunately it has (on top of inching closer to the big 40!). I recently bumped into an old H.S. friend that I haven’t seen in a very long time. We chatted about the concept of time and how strange it is. It’s quite perplexing how quickly 20+ years has passed since our H.S. graduation. We’re now in our late 30’s with little ones at home – how did we get here so rapidly?! For most women, childbearing years are over by early 40’s, but the delicate balance the reproductive system plays is a crucial and vital part of a healthy anatomy. Ovaries are a huge role in helping to keep everything in check. Is there life after natural menopause, yes of course. Some women struggle more than others and I know there is life after medically induced menopause, even at a younger age, but the thought of physically losing my ovaries now vs. allowing the process to happen naturally, freaks me out! Unfortunately I don’t have much comparative analysis to go off of. During chemotherapy, Zoladex shots were quite harsh on my system, which has fed into my fears of medically induced menopause. I’ve been telling myself those side effects were worse because of the Zoladex itself and of course being in treatment, but I cannot help but fear an oophorectomy will induce similar side effects; horrible debilitating hot flashes, NO sexual libido, vaginal dryness, and more. 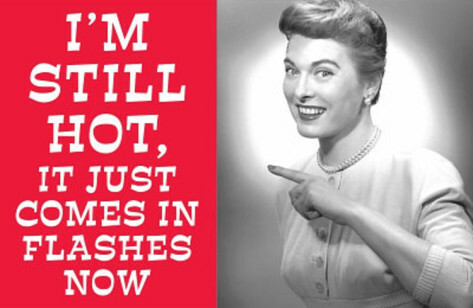 My mom had medically induced menopause at 50. This was after her 2nd cancer diagnosis in 2001, and after learning about BRCA, ultimately testing to see if she carried the mutation. After she tested positive for BRCA1, she had a double mastectomy and an oophorectomy, but didn’t have many negative side effects from the oophorectomy, just some minor hot flashes. It was a relatively easy transition for her. I am not sure if her age played a role. She was 50 at the time. My oophorectomy will be at 40. A big part of my femininity and confidence was lost when I had my mastectomy. In the weeks following the surgery, it was hard to face what I looked like in the mirror. I’m sure my fellow breasties can relate. Your body goes through a drastic transition. Both my sister and I watched our anatomies change as our expanders filled over time and eventually got swapped out for regular implants. It’s now been a year since my “swap” surgery, but I’m still not happy, at least not as happy as I was with my natural breasts. I’m pretty sure my sister unfortunately feels the same. At least with our breasts, more tweaking can be done, though through surgery, but once your ovaries are removed, that’s it. That organ is no longer a part of your body’s reproductive system, which I think is a big part of what helps to define us as women. So I’ve been trying to look at the silver lining of all this. My family has been through so much loss with my cancer diagnosis, and of course my mom’s years ago, that I want to try and refrain my perspective of losing my ovaries. Instead of looking at it as yet another loss, perhaps I can try to view it as a benefit… no more PMS for one!!! Yeah, that’s a pretty huge benefit isn’t it ladies? Who likes PMS?? And perhaps medically induced menopause can actually help hormonal fluctuations since PMS is no longer a factor? I do intend on utilizing HRT (hormone replacement therapy) for the first 4 years post oophorectomy. Research shows it is more beneficial to go this route at a younger age and can possibly help prevent future health problems. I’ve touched on this in prior posts that early on-set menopause can create issues with osteoporosis, elder dementia, cardiovascular concerns, but my oncologist does not recommend HRT for more than 4 years. At that point, the risks out way the benefits and can cause other potential problems, including higher risk of cancer. For fellow BRCA’nites who’ve already had oophorectomies at a younger age, how has early on-set menopause affected you? Was it what you expected, worse or better? Did you try HRT? Has it been helpful? I urge you to please share with our community! !